Despite their different capabilities Batman: Arkham Origins Blackgate should be almost identical on Vita and 3DS. It's not hard to understand why Batman: Arkham Origins gets to be the center of attention. Aside from it just being a big game, it's generally had more news to follow than other Batman games. The reveal, for instance, that the Arkham series was switching developers from Rocksteady to Warner Bros Games Montreal was an understandable distraction for Bat-fans. Likewise, the supposed departure of franchise veteran voice actor Kevin Conroy was another rumor that caught fans attention, though it thankfully turned out to be less than true. While Arkham Origins may be the main dish however, it's worth remembering that other studios are working on Bat-centric projects in tandem with the console game. Batman: Arkham Origins Blackgate, for instance, looks to bring the Arkham experience to the 3DS and Vita with some changes for portability. Rather than the full 3D that gamers have grown used to in the Arkham console games, Blackgate will be a 2.5D Metroidvania style game taking place after the events of Arkham Origins. 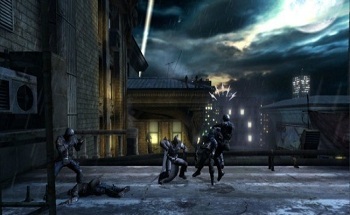 While the game's status as the smaller sibling of Arkham Origins might automatically earn it a few rolled-eyes from skeptical consumers, its developers at Armature Studio are working hard to make sure the game is as excellent as its console counterpart and that the 3DS and Vita versions of the game are equivalent to one another. "It's a combined effort," said Jack Matthews, Technical Director for Armature. "Most everyone has both dev kits on their desk." While the Vita and 3DS are different gaming systems with radically different capabilities, Armature is building the Blackgate so that the only difference gamers playing the different versions should notice are the visuals. "Vita has higher res assets, 3DS has 3D. We have custom tools to help generate ideally sized models for each platform from a common source." It's not uncommon for the same game across multiple platforms to be a wildly different experience depending on the capabilities of each machine and the developer behind it. That in mind, if the two versions of Blackgate can truly be equivalent experiences outside of their presentation, it will be an welcome feat on Armature's part. Of course, if they wind up being equally awful that would be a shame, but thus far Blackgate is looking good. With luck, it will finish good too.